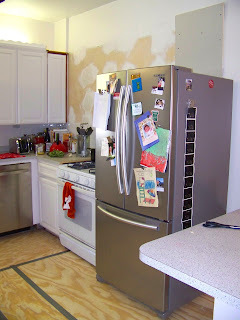 Our goal with this kitchen renovation is to slowly get to the correct configuration that works for us by doing small changes so that when we actually want to replace the cabinets, we won't have to live without a kitchen for weeks. 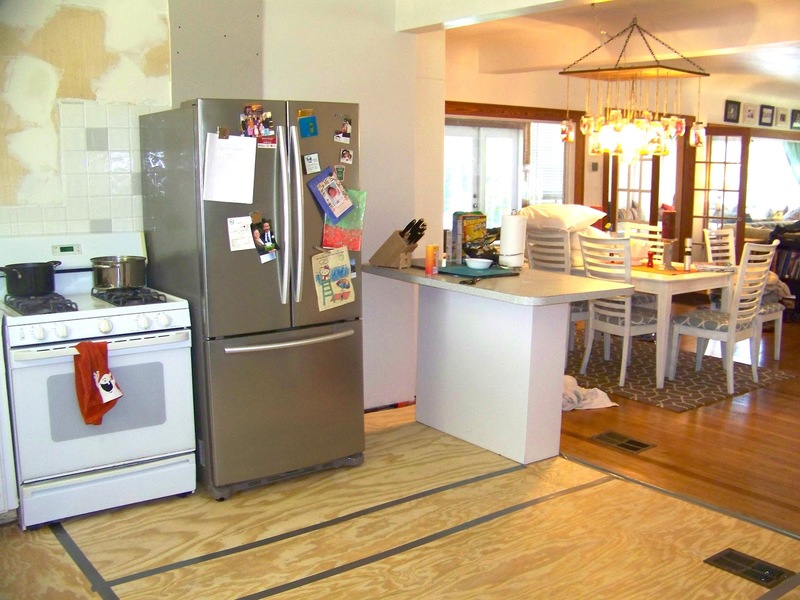 Earlier this week you saw how we pulled up most of the floor and today we are going to show you how we got the kitchen configuration as close as we can without taking a wall down. Since putting in the pantry, we haven't actually used the cabinets above the stove or really any of the cabinets on that wall. This has been slightly purposeful since we want to use this wall for the wall oven and the refrigerator. Since we haven't missed these cabinets for months, we felt comfortable completely removing them. We are hoping to use the cabinets from the kitchen out in the garage for organization. 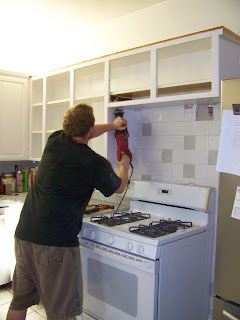 Initially, we were hoping to pull all the cabinets on this wall down in one piece but after a few attempts, it was clear that this approach was going to cut it (all of the cabinets are put in with nails not screws so there is a lot of prying involved). So Nate got out the big guns and cut off the mini/odd cabinet. That cabinet didn't make it but once it was out of the way we were able to get the rest of the cabinets off in one piece to use in the garage. 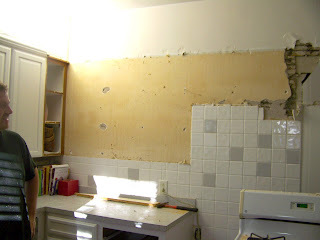 We were left with a lot of nail holes and some damage where we had to pry the cabinets away from the wall. We aren't really concerned about this since this wall is coming down so we did some quick patches so it isn't glaringly ugly in the mean time (it still needs a coat of paint). One of the doors from the removed cabinets even fit on the opening that was left on the other cabinets so nothing is too out of sorts. We also removed one of the lower cabinets. 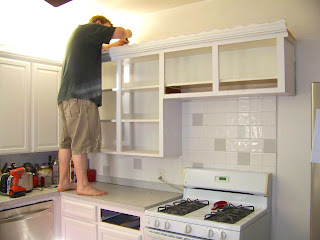 We didn't remove both because we are planing on having a skinny pantry style cabinet in the recessed area so by leaving one of the cabinets it spaces everything correctly (although not in the correct order). This gives us a better feel of the spacing for the peninsula. Speaking of the peninsula, we are using the old kitchen island as the peninsula right now. You have to use your imagination a bit. All of the appliances will be recessed into the wall behind them so they are flush with the wall. Then the peninsula will be wide enough so that it takes up the space all the way to the recessed area. It will also be a few feet longer so it will be a huge workspace. 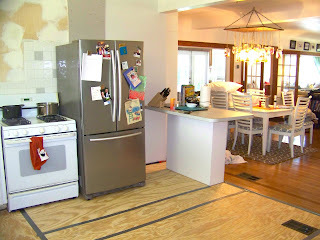 Right now since the island is small, we there is enough space between the fridge and the island to work on the full length so we get a feel for the layout. We are really loving this change. Already, the kitchen is huge compared to configurations in the past and when everything gets recessed, we are going to gain another 3 feet along that wall. We still have quite a ways to go before this project will be finished, but we are getting a lot closer! How exciting for you! Looks like you will have an amazing kitchen very soon! Cheers.